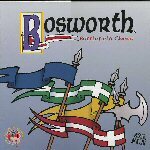 Bosworth is essentially a chess variant for up to 4 players. The pieces are the same as chess (8 pawns, 2 knights, 2 rooks, 2 bishops, a king and a queen) but they are represented as disks so that they can be drawn randomly from a pile. Players begin the game with 4 pawns in their edge of the board or "field camps" and four pieces from their draw pile as their hand. On each turn, a player must move or capture with one piece, fill empty spaces in their field camp with a piece from their hand, and then draw to bring their hand up to four pieces. Pieces move and capture very similarly to chess. As in chess, the object is to checkmate all opponents kings.